Wrigley is introducing a new sugar-free stick gum with mouth-freshening, long-lasting flavors combined with invigorating sensations you can feel as you chew. 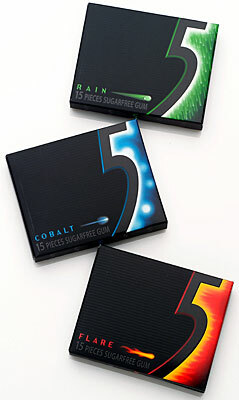 Available in Rain (a tingling spearmint flavor), Cobalt (a cooling peppermint flavor), and Flare (warming cinnamon flavor), 5 debuts in a fifteen-stick envelope package. The Wrigley Company revitalized tab-style gum in 2001 with the introduction of Orbit and its unique formulation and packaging. Last year, it introduced the Eclipse BigE Pak bottle for the pellet gum segment. The 5 envelope will cost $1.49 for individual packs and $3.49 for a three-pack.